we have such an exciting event going on ALL MONTH LONG! 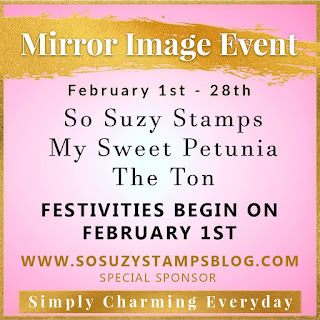 We are celebrating the Mirror Image Stamp which coordinates with the Misti Stamping Tool! 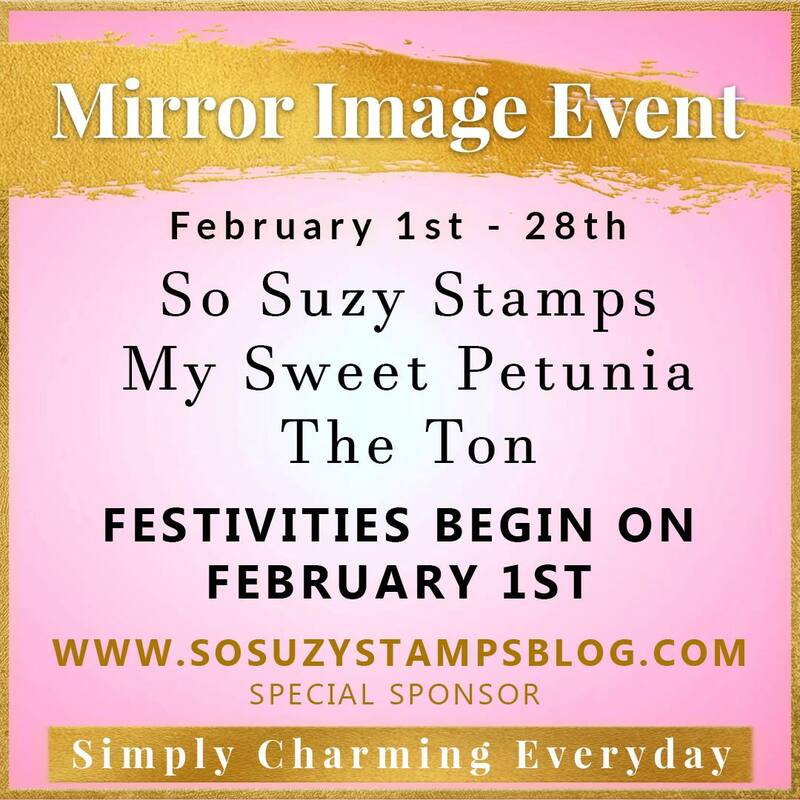 All month long, different bloggers will post a card using the Mirror Image Stamp and you can find the list of bloggers here. In my video tutorial today, you can see how to use the Mirror Image Stamp on your cards. It's so fun and easy! Check out the rest of the posts here! I loved your tutorial on mirror imaging. I have to get the large rubber stamp. I continue to be amazed with both the Misti and the Mirror Image stamp. Your video is a great example of how simple it is to use this technique. Thanks for keeping it simple! Love the the card . What a A create tool. It's a must have . Thanks for sharing. Thanks for sharing this new product. Lovely card. Appreciate the video showing this technique. Beautiful card and great tips on using the Mirror Image Stamp! Thank you! Your card is so pretty! I love this technique. So clever!! Thank you for your videos. Love all the MISTI tips! I love your sweet fairy mirror image card! Thank you for sharing your 10 tips using the Misti too! Beautiful card. The fairy mirror image is just perfect. Beautiful card. I love all the new techniques Misti has to make this tool more versatile. You just make it look so easy and I learn so much from your videos, Thank you! Just love the way the mirror image stamp and Misti work to create this amazing card! Darling!! LOVE these adorable little fairies! I just ordered the mirror image stamp yesterday and am anxiously awaiting it's arrival! I couldn't believe it but it was shipped within less than 15 minutes of placing my order! YAY! LOVE lightening quick shipping! TFS! I love your card and am so grateful to find something that I can actually do this with. It has been years since I wanted to do this and acetate does not work so good. Thanks for sharing. I am so glad this product is available, it's going to give me a lot more options with my stamps! Beautiful card, thanks for the demo. Love the simplicity of this card! So stunning! Rubber stamp looks like it makes a Much better Mirror Image! Very sweet card! So cute but also quick to make! I love this technique and can't wait to see what else is created. Look at those fairies, love your videos my dear Justine, my brain is getting all those mirror tips. Mirror mirror who has the best card so far, hum, all of them! Beautiful card. I love the ink blending with the solid images. Thanks for the tip on restamping to get the color the same on both the original image and mirror image. The mirror image stamp is definitely a must have! This is very pretty! I love how well the mirrored image looks! So cool! This is just the coolest thing. I need one. Good video too. Such a great card Justine and fantastic videos on how to use the mirror image stamp! I think this would make mirror stamping so much easier. It's really pretty, the images and the background colors... Everything. What a lovely stamp, I can see why you like it so much. Your card is beautiful. Thanks for this great video technique...love it!! Great video! Don't think I can last much longer without that sweet fairy. It seems the uses for the MISTI are endless, but adding a mirror image stamp just increased them! LOL! Love, love, LOVE this card. Thanks. Love your card! The fairies look amazing and perfectly done!!! I had a reverse stamp pad years ago but it was wood mounted. To have one for the Misti that is large sounds great! Thanks for the video and chance to win so many awesome prizes. Your cards are always beautiful. Simple with quite the impact. I'll have to get this stamp and try this technique. Really pretty card. Do you have any tips for stamping rubber sentiments straight? You always do it well. This is such a sweet card. I love all of the pink and who can resist fairies? Loved your card and tutorials! Mirror mirror on the wall how much will this hop cost me when it is all done. I love these fairies. Sweet card. Love the way you colored it. Thanks for sharing how you used the mirror image stamp and the Misti to make this sweet card. Thanks for sharing the video. Love the beautiful fairy card. So nice with the MISTI to get a very dark impression with the shadow stamps. Love the MISTI! Beautiful card! How awesome to get a mirror image. Beautiful card and great video tutorial! Love the possibilities of using the mirror image stamp, thanks for the inspiration! What a sweet card. This mirror stamp definitely looks to give a good image. Thanks again for your creative and informative videos. I love this new tool and your card! Beautiful card. Thanks for your videos. Such a pretty card! I love using fairies in my card making and I can't wait to try the mirror image stamping! So cute! Love the example of a solid stamp used as mirror image!! Thanks for the inspiration! Thanks for sharing this lovely card and technique. enjoyed both videos. thank you. Love this card! Thank you!! Adorable card! Great video on using the new rubber mirror stamp. It looks awesome. Your fairy card is so beautiful! I love the embellishments you used and also the color you used. Thank you for sharing your videos. Thank you for the great video! Love the card & fairies are one of my favorite things! Love the card, who doesn't love fairies! I am still practicing that shading, you make it look so easy. Nice work!! , that big red rubber stamp looks so cool! Great tutorial and beautiful card. I really love the fairy. I also like all of your cards. Thanks for the tips and video - I love the angels looking at each other! You make everything look so easy!! Love your demonstrations!! Such a sweet card! Love the CAS design! Adorable! Lovin' all these cool techniques! Love that the fairies can be used together. Justine, your video was the first I saw on the MISTI. I hate to tell you how many years I have had that blank rubber stamp always wondering what it was for! Now your video is the first I've seen on using that! Now I have twice as many stamps as I used to! All of your tutorials are so helpful. Thank you! Your card is very pretty and thank you for sharing all the different ways in which we can use our MISTI!!! Those fairies are adorable & so is your card! Thanks so much for the awesome videos. Loved the video. Thank you for sharing. Your card is lovely. I need the mirror rubber...fantastic! Great tutorial and love the card. The pink is so pretty with these beautiful fairies. Beautiful job. Your tutorial is very helpful! Thanks for sharing! I love the colors of this card. The fairies are magical and the drops are so pretty. Wonderful mirror of the fairies. This card is one I will have to recreate for myself to give to a special little girl that we are making a fairy garden for when the weather breaks. Thanks for the video makes learning how so much easier. My teen aged daughter would love to have some fairies in her room and putting them together like this is perfect. Now to get the mirror stamp and catch her when she is not doing homework, sleeping, or eating. Maybe I'll just do it for her. LOL! Simple AND gorgeous!! love that background! So gorgeous! I am so glad you girls are covering this technique. I tried it and LOVED it. I had your video open while I stamped.. Thanks for the guidance. Adorable little fairies. What girl wouldn't want to receive this card? Mirror image stamping is so creative and I'm getting some really fun ideas. Thank you. Love the fairies with the blended background! As always, great video. Thanks for the clear instructions about how to use this stamp. I just got distress ink, can't wait to try it with mirror stamping! Beautiful card Justine! Love the blending over the fairies and sentiment. The more cards I see using the mirror image the more I think I need it. Awesome video. I need to get a large plain rubber stamp. TFS!!!! This hop has really opened my eyes to new ideas!!! Thanks for hosting this!! Love the way the colors fade. Great card. Every time I say "ta da" mirror image. Perfect tool!!!!!! Such a cute stamp. Your faded blending is awesome. Love the fairies and that gorgeous pink color. So grateful for all these videos. Beautiful card! Love your colour choice and blending. Those fairies together like that is perfect! Love your videos. I always learn so much.